Just as the armed forces face a shortage of volunteers, the Army is bleeding professional soldiers. Gen. Juan Miguel Fuente-Alba complained that an average of 126 soldiers each month have been leaving the Army for higher-paying jobs in the private sector. Most losses are in the north of Chile, where mining companies have lured soldiers with higher salaries. To the mining industry, soldiers are an attractive source of labor. They've acquired technical and professional skills in the Army, and they're used to working in adverse conditions. The Army sought 7,000 professional soldiers for 2012, although 6,726 were budgeted. Already, nearly 6,000 are in the Army, leaving about 750 that would be added from enlisted personnel. Professional soldiers became part of the Army in recent years, as increased use of technology made it necessary to have soldiers with training and experience in various systems. For years, the Air Force has suffered a similar problem. It has lost many pilots to commercial airlines, where salaries are many times that of the military. Although Chile has compulsory military service, for years no one has been forced into serving. That's because there have been plenty of young people wanting to serve voluntarily and to take advantage of the free education in the armed forces. But that's changing. Facing a 30% drop in volunteers for next year's conscription class, Direccion General de Mobilizacion Nacional called up 56,793 men from registration rolls. About 11,000 would need to be drafted, according to one report. The call-up is a consequence of student protests sweeping Chile, said Gen. Günther Siebert Wendt, the commander of mobilization. Volunteers are down because "not only are schools closed, but there's also no possibility of reaching schools to incentivize youths to sign up for military service," the general said. Still, Gen. Seibert said the armed forces hope to fill all positions with volunteers. Even if someone is drafted, it's easy to get a deferment or excuse. If you go in the Army or Air Force you'd serve 12 to 14 months. Navy conscripts serve for up to 24 months. Women are not drafted but can volunteer, as long as they are single and have no children. Defense Secretary Andres Allamand confirmed Chile has acquired unmanned aerial vehicles from Elbit Systems in a deal finalized during visits to Israel and Norway last month. The Hermes 900 UAVs will join Chile's efforts to beef up its border security, namely to curb illegal drug trafficking. The border with Bolivia is especially troublesome, with more than 100 unguarded passes. The Hermes UAVs can be equipped with optics such as thermal imaging cameras and other sensors for that task. Chile's defense and interior ministries have launched Plan Frontera Norte (Plan Northern Border), which includes purchasing ground radars, thermal imaging systems for land and sea surveillance, and command and control systems. The cost was put at $10 million, and the equipment will be handled by the national police. The plan is the latest example of how Chile's security focus is shifting from traditional defense to internal and C3 (command, control, communications) areas. Internal security problems such as education-reform protests and the rebellion of indigenous people are being handled in conventional ways (mainly riot control). But the fight against drugs takes high-tech equipment, which is where more funds are being allocated. 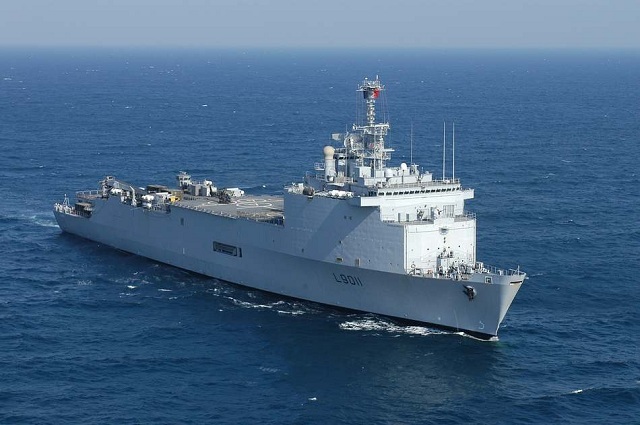 Chile's long flirtation with the French has finally come to fruition as the government finalized negotiations to purchase the amphibious landing ship Foudre. The ship could be in Chilean hands in the first half of 2012, the Navy confirmed, adding that the final contract will be signed in November. The cost reportedly was $80 million, according to reports, which sounds like a bargain for a ship of the Foudre's size and capability. Indeed, the acquisition represents a big leap in sealift and force projection power for Chile, which in January retired its 40-year-old Newport-class landing ship, the Valdivia. The Navy's sealift force was reduced to a pair of 1,400-ton landing ships and another two 770-ton vessels. The 12,000-ton Foudre can carry a batallion of 467 troops plus mechanized cavalry equipment, including as many as 100 vehicles and 22 Leopard II main battle tanks. Its deck and hangar can accomodate up to seven medium helicopters. The well dock can fit either 10 medium landing craft or one mechanised landing craft and four LCMs. In another important role, it can serve as the backbone of relief operations. The ship can squeeze as many as 1,600 people in disaster scenarios, and its hospital facilities include two operating rooms and 47 beds. The Foudre was commissioned in 1990, so it doesn't exactly have fresh sea legs. Still, sea transport is crucial for Chile to reach its island communities and isolated areas in a disaster, not to mention its peacekeeping force in Haiti. The massive 2010 earthquake and tsunami underscored the need for sea-based relief operations. For a couple of years, Chilean naval officers had expressed interest in the Foudre and similar ships that came on the market. The 12 M-109 self-propelled howitzers being refurbished by BAE Systems for delivery to Chile are of the M-109A5 model, a company executive told MercoPress. The model features the M284 155mm gun and M182 mount, which extend the firing range by 25% compared with the earlier version of the M-109. The upgrade work includes adding digital data connectivity and gun positioning and navigation systems. Where is the new artillery battalion headed? To the 3rd Armored Brigade near Antofagasta, a colonel told a news show. The MercoPress item also mentions that BAE worked on the upgrade of Chile's M-113s, a program that brought up those armored personnel carriers to the M-113A2 standard.